Meet me in Toulon and let’s go to Saint Tropez ! From your cruise ship or hotel in Toulon one of the must of the area is a day tour to Saint Tropez. The drive from Toulon to Saint Tropez takes 1h30. The road between the two cities is a real delight. We will follow the blue coast of Provence and cross the Moors Forest. On the way the panoramas on the coast is gorgeous. Especially by Le Lavandou Bay where we can admire the islands of the Port Cros National Park, also called the Golden Islands. Arriving by Saint Tropez we can do many things. First, I like to bring guests to the Cape Camarat Lighthouse. From the top of the rock next to the lighthouse is the best panorama over the famous Private Beaches of Saint Tropez. From there we can see all the beach which is called the Beach of Pampelone. Then, let’s have a little panoramic drive in Saint Tropez. We will pass by the Old Port fulfilled with luxurious yachts and awesome sailing boats. A small street will lead us to the 16th century fortress and down the fortreess we will arrive bu the Lices Square where the market stands on tuesdays and sundays. Let’s finish our panoramic tour of Saint Tropez by the Baie des Canebiers. Located in wealthiest neighborhood of Saint Tropez this bay and its pristine sandy beach is known only by the locals. We should continue with a walking tour into the old Saint Tropez where I will show you the oldest building from 980 and the village mostly built in the 16th century. To complete our exploration of Saint Tropez I hoghly recommend the Annonciade Museum. A little treasure of Impressionist Painting showing some masterpieces from Signac, Seurat, Van Dongen, Matisse or Braque. All of them made by those painters in Saint Tropez. We can stop for lunch wherever you like. On the port of Saint Tropez, by a private beach if you like the party atmosphere, or by a nearby village if you are looking for a more peaceful environment. Indeed the hilltop villages around Saint Tropez are pure beauties. 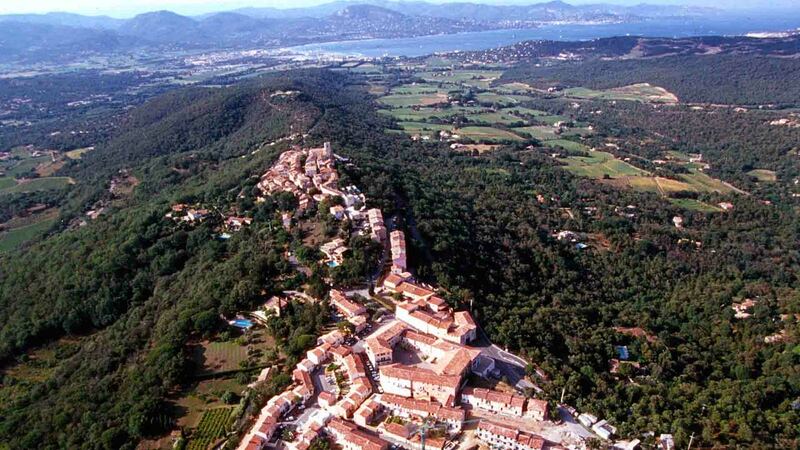 Grimaud offers a superb view on the Gulf of Saint Tropez from the ruins of its 10th century castle. Gassin is a tiny snail shape village perfect for a little bit of shopping. Bur my favorite place for lunch enjoying an amazing panorama over the sea and the hills full of vineyards is Gassin. After lunch we can visit a wine estate and taste some of the wines produced here. I know about a small Château making special wines using bio-dynamic techniques and processing fermentation in amphora and special eggs. Join me and let’s have a perfect day in Saint Tropez.